Nassau County Executive Edward P. Mangano today announced that a major streetscape project will begin in the coming months on Farmingdale’s Main Street. Farmingdale, NY - November 22nd, 2013 - Nassau County Executive Edward P. Mangano today announced that a major streetscape project will begin in the coming months on Farmingdale’s Main Street, a major improvement to the Village that will help bolster the local economy in a downtown that continues to serve as a model for revitalization and growth in Nassau County. The approval of an economic development compact for a $28.3 million apartment/retail project in downtown Farmingdale. The project, which broke ground yesterday, will provide much needed affordable rental options for young professionals in Nassau County and provide a boost to businesses in downtown Farmingdale. The award of $225,000 in Federal Community Development Block Grant (CDBG) funds for the Village of Farmingdale to facilitate major improvements within the Village’s business district, all of which are consistent with the Master Plan. 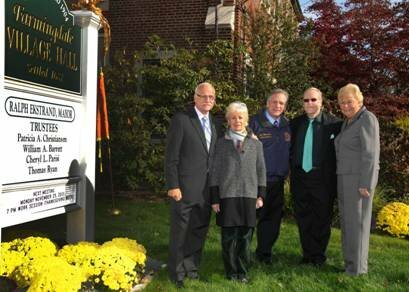 Federal funding has provided the Mangano administration the ability to partner with Village of Farmingdale Mayor Ralph Ekstrand for commercial rehabilitation and beautification of the Village’s business district, including new signs, sign board accessories, building and sign lighting, and awnings. Phase II of the project will be focused on improvements to the rear facades and rear entrances of buildings that will include signs, lighting, and awnings. The Village’s multi-year streetscape improvements along the commercial stretches of Main Street will continue to make Nassau County a better place to live, work and raise a family. “The Main Street streetscape project compliments the transit oriented development projects and downtown walkability that our village needs for continued economic growth. We again thank the County for all the assistance provided in helping our Village achieve economic growth,” stated Mayor Ralph Ekstrand. The streetscape project will include new curbing, brick pavers, concrete sidewalk and roadway paving to the downtown area. Nassau County worked closely with the Village of Farmingdale in planning the project. The streetscape project will be completed by Deer Park-based Tri-State Paving, Inc. The company was chosen through a competitive bidding process and approved by the Nassau County Legislature. The cost will be $978,590 and the construction is expected to last approximately three months. Subject: LongIsland.com - Your Name sent you Article details of "Mangano Announces Farmingdale Streetscape Project And Continued Economic Development For The Village’s Downtown"